An ant or roach problem is a big concern, but facing bed bugs takes things to an entirely different level. When it comes to bed bug control, the same solution is used for both hotels and homes. Because these bugs are extremely different to get rid of, it is essential to research the top bed bug companies. These companies possess experience and expertise in bed bugs control. Regardless of which of the bed bug companies that you hire, the first step involves confirming the presence of these pests. As far as appearance, bed bugs are a reddish-brown color with a flat, oval-shaped body about the size of an apple seed. Although they feed on blood, when conditions are cool, they can last a full 12 months without feeding. Bed bugs are nocturnal, meaning they are active while you sleep. For that reason, the company you hire will start by inspecting crevices in the mattresses. However, other areas will be carefully checked, like electrical outlets, baseboards, furniture, and picture frames, among others. A professional company that offers pest control in Toronto knows exactly where to look. Bed bugs are brought inside by other people, whether hotel guests or home visitors. They often hide in purses, luggage, rolled-up coats and sweaters, and even on human bodies. Once these bugs make their way indoors, they can be extremely difficult to treat. For the best success, the infestation should be caught early. Typically, the first sign of having a bed bug problem is small red bites that appear on the body. 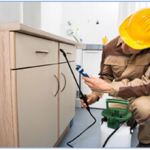 Depending on the severity of the infestation at a hotel or home, the pest control company that you hire will determine the best course of action. Whatever implementation method is used, it will target not only live bugs but their larvae, as well. In addition to professional treatment, any bed linens and blankets will need to be washed and dried using the hottest temperature setting possible. For a really bad infestation, these items may need to be tossed out. After the initial visit by the pest control company, a follow-up visit is required. That way, the technician verify that the treatment was effective. Preventing bed bugs from entering a hotel room is difficult. At home, closely check any outside furniture purchased from a thrift store, auction, or some other source. In addition, after taking a trip, having overnight guests, or people enter the home for service calls, perform an inspection. Bed bugs are among the worst in the pest world. Our team of experts at Pestico can help with these bugs and many others. Please visit our website to learn more about our services or call us today.